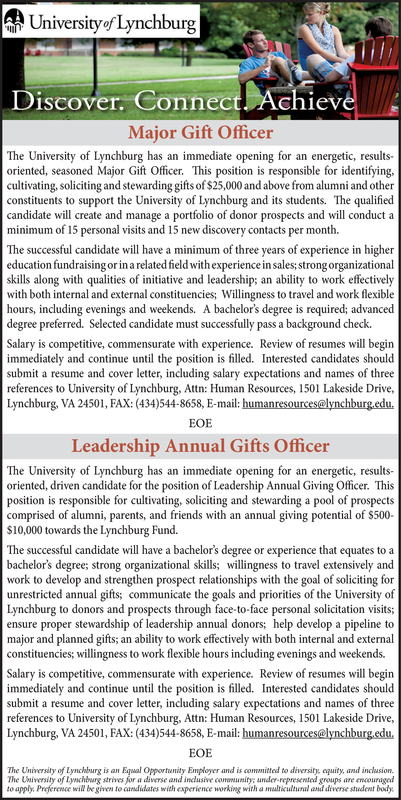 The University of Lynchburg has an immediate opening for an energetic, results oriented, seasoned Major Gift Officer. This position is responsible for identifying, cultivating, soliciting and stewarding gifts of $25,000 and above from alumni and other constituents to support the University of Lynchburg and its students. The qualified candidate will create and manage a portfolio of donor prospects and will conduct a minimum of 15 personal visits and 15 new discovery contacts per month. The successful candidate will have a minimum of three years of experience in higher education fundraising or in a related field with experience in sales; strong organizational skills along with qualities of initiative and leadership; an ability to work effectively with both internal and external constituencies; Willingness to travel and work flexible hours, including evenings and weekends. A bachelor’s degree is required; advanced degree preferred. Selected candidate must successfully pass a background check. The University of Lynchburg has an immediate opening for an energetic, results oriented, driven candidate for the position of Leadership Annual Giving Officer. This position is responsible for cultivating, soliciting and stewarding a pool of prospects comprised of alumni, parents, and friends with an annual giving potential of $500-$10,000 towards the Lynchburg Fund. The successful candidate will have a bachelor’s degree or experience that equates to a bachelor’s degree; strong organizational skills; willingness to travel extensively and work to develop and strengthen prospect relationships with the goal of soliciting for unrestricted annual gifts; communicate the goals and priorities of the University of Lynchburg to donors and prospects through face-to-face personal solicitation visits; ensure proper stewardship of leadership annual donors; help develop a pipeline to major and planned gifts; an ability to work effectively with both internal and external constituencies; willingness to work flexible hours including evenings and weekends. Salary is competitive, commensurate with experience. Review of resumes will begin immediately and continue until the position is filled. Interested candidates should submit a resume and cover letter, including salary expectations and names of three references to University of Lynchburg, Attn: Human Resources, 1501 Lakeside Drive, Lynchburg, VA 24501, Fax: (434)544-8658, E-mail: humanresources@lynchburg.edu. Lynchburg College is a private, independent, residential college located on 250 beautiful acres in central Virginia. The student body numbers 2,800 undergraduate and graduate students. LC offers 39 undergraduate majors, 52 minors, 13 pre-professional programs, and 14 graduate degrees, all supported by a strong liberal arts foundation. On-campus housing is guaranteed for four years to all undergraduates who choose this option. But what makes us truly unique? Two doctoral programs In addition to our undergraduate and master's programs, we're proud to offer two doctoral programs: the doctor of physical therapy and the doctor of education in leadership studies. Claytor Nature Study Center Our commitment to a sustainable lifestyle is supported by the Claytor Nature Study Center. This 470-acre outdoor classroom provides learning opportunities for the LC and local communities. Our active student body Our students are active - really active. 70% play varsity, intramural, or club sports. They contribute over 70,000 hours of community service each year. And they join over 80 clubs, organizations, fraternities, and sororities. Our location LC is spectacularly located in the foothills of the Blue Ridge Mountains in central Virginia. For lovers of the outdoors, there's no shortage of hikes, climbs, rivers, and streams. If you're more the city type, head to Washington, D.C. (180 miles) or Richmond, Va. (120 miles). The LC spirit And then there's the LC spirit. New students quickly learn that being friendly and helpful is an LC tradition. We are a truly caring community; you'll hear it called "family" again and again. You don't have to just take our word for it, though: LC is one of only 40 schools featured in Colleges That Change Lives, a guide for students who want to choose a college that is uniquely suited to them.